News21 is a 10-week summer fellowship program sponsored by the Carnegie Corporation and Knight Foundation. The goal of the national initiative, which is led by 12 of America’s leading research universities, is to advance the U.S. news business by helping revitalize schools of journalism. 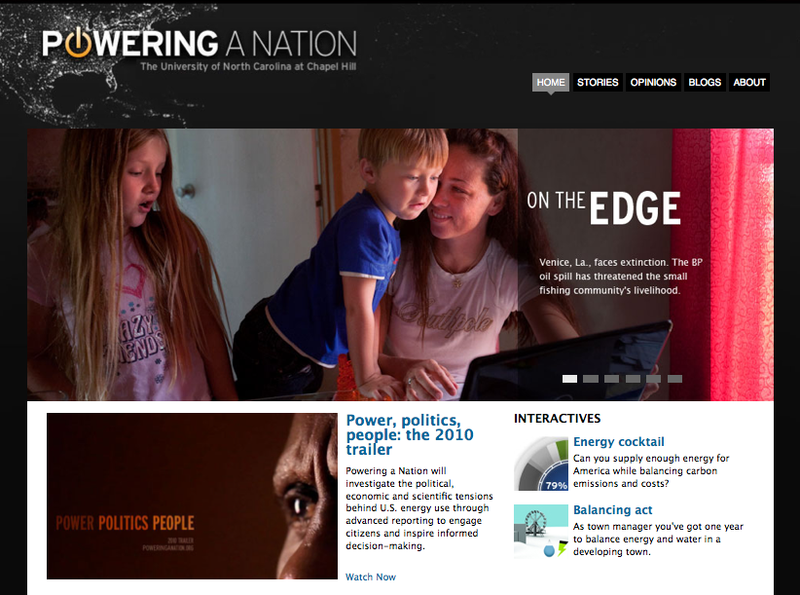 Powering a Nation is the project created by UNC-Chapel Hill journalism students and combines the content of the 2009 team with the 2010 content. I was a part of the team 2010 project team. As of 2013, three additional project have been added to the site. Managing editor – student leader with primary responsibilities in conceptualizing stories and leading the content gathering team, collecting photo, video and audio content. Videographer/Photographer – worked on stories about the impact of the Gulf oil spill on families in Venice, La., nuclear power in Georgia and Vermont, and the politics of energy. Video Producer – edited Splitting main street: The nuclear energy debate, a trailer for the video and the trailer for the site’s 2010 content. Writer – wrote articles about BP contracts for oil spill clean up workers and the EPA’s role in controlling greenhouse gases.